Enjoy these fun fossil facts for kids. Children will learn how fossils are formed, what the words paleontology and petrification mean, how we know so much about the dinosaurs and much more. What are fossils and what is paleontology? Paleontology is the branch of biology that studies the forms of life that existed in former geologic periods, primarily by studying fossils. The only direct way we have of learning about dinosaurs is by studying fossils. Fossils are the remains of ancient animals and plants, the traces or impressions of living things from past geologic ages, or the traces of their activities. 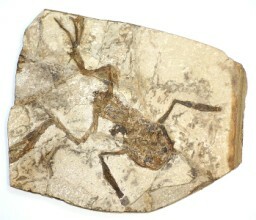 Fossils have been found on every continent on Earth. The word fossil comes from the Latin word fossilis, which means, "dug up". Most fossils are excavated from sedimentary rock layers (Sedimentary rock is rock that has formed from sediment, like sand, mud, and small pieces of rock). Over long periods of time, these small pieces of debris are compressed (squeezed) and are buried under more and more layers of sediment that piles up on top of it. Eventually, they are compressed into sedimentary rock. The fossil of a bone doesn't have any bone in it! A fossilized object has the same shape as the original object, but is chemically more like a rock. Some animals were quickly buried after their death (by sinking in mud, being buried in a sandstorm, etc). Over time more and more sediment covered the remains. The parts of the animals that didn't rot (usually the harder parts like bones and teeth) were encased in the newly formed sediment. In the right circumstances (when there is no scavengers, quick burial, not much weathering) parts of the animal turned into fossils over time. After a long time the chemicals in the buried animals bodies underwent a series of changes. As the bone slowly decayed, water infused with minerals seeped into the bone and replaced the chemicals in the bone with rock-like minerals. The process of fossilization involves the dissolving and replacement of the original minerals in the object with other minerals (and or permineralization - the filling up of spaces in fossils with minerals, and /or recrystallization in which a mineral changes its form). In the end we get a heavy, rock-like copy of the original object - a fossil. The fossil has the same shape as the original object, but is chemically more like a rock! Petrification can preserve hard and soft parts and slowly replaces organic material with silica, calcite or pyrite, forming a rock-like fossil. Wood is often found petrified. Some organisms are embedded in Amber (a hardened form of tree sap). This usually preserved insects or pieces of plants. Fossils of imprints may form, like casts of dinosaur footprints. The impressions, in the right circumstances, fill with sediments that fossilize. Most animals did not fossilize, they simply decayed and were lost from the fossil record. Paleontologist’s estimate that only a small percentage of the dinosaurs that ever lived have been or will be found as fossils.